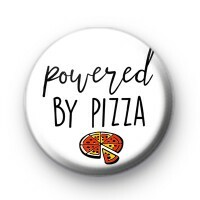 This black and white slogan badge has the text 'Powered By PIZZA' and a picture of a pizza. It is ideal for any fellow pizza addicts out there. People who love food, in general, need this badge! Whether you love the humble Margherita Pizza or a yummy calzone or just like to be a little more adventurous and add lots of toppings & get a delicious deep pan. If you love Pizza then you are my kind of person!